A market town characteristic of the Great Plain with 22,631 inhabitants at national highway No. 4. The centre of Great Cumania, its history dates back to the devastation caused by the Mongols in the 13th century. The memorial place next to the national highway commemorates the immigration of the Cumanian people. The characteristic features of the region are shown in the Country House of Great Cumania. 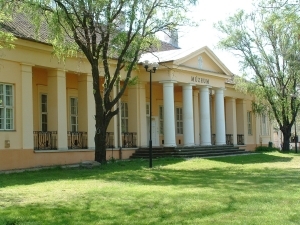 In addition to the local history collection, rich exhibitions of ethnography and folk art can be seen in the Györffy István Museum of Great Cumania, named after the famous ethnographer. The town has retained its name in pottery: the bequest of the world-famous folk artist, Sándor Kántor, can be studied in the Pottery House. In the House of Craftsmen you can see the works by handicraftsmen living in Great Cumania. At the Exhibition of Medical History and Pharmacy you can see the original 100-year-old furnishings, medical instruments and devices of the Pharmacy. The Calvinist church built in 1743 and reconstructed between 1793 and 1797 is in Kossuth Square, in the heart of the town. The former presence of Greek merchants is proven by the Greek church with a fine iconostas and valuable, 18th century ritual books. The graceful Catholic church was built at the turn of the 19th and 20th century. The most outstanding events in the town include: Mihály Kováts Memorial Days (in May). Mutton cooking competition (in June), Cultural Days of Great Cumania (in August), Karcag Equestrian Days (in October). The water of the medicinal thermal bath is excellent for curing locomotor, gynaecological and some dermatological problems. The fun bath and the swimming-pool offer relaxation for the visitors. The southern entrance gate of the Hortobágy National Park, which is part of the World Heritage, is the Szélmalmi (Wind Mill) Reception House which is ideal for the lovers of ecotourism. There are possibilities for fishing and hunting. Interesting sight is the herd of racka sheep, which can be reached from the old road No. 4. The botanic garden of the DAC Research Institute of Karcag is a special natural value. Karcag is the land of legends. Legends are connected to the Cumanian hills, the cart-roads, the wells at the border of the town. Karcag is the town of artists. Lots of artists live in the town, including several poets and writers. Painters and graphic artists also work here, but wood-carvers, great cabinet-makers, famous potters, lace-makers, folk artists producing Cumanian embroidery and embroidery of the Hungarian shepherds can also be found among the inhabitants of the town. 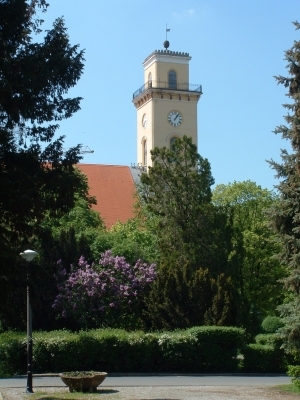 Sculptor Sándor Győrfi, who was awarded a Munkácsy and a Mednyánszky prize, lives and works here. Karcag is the town of statues. 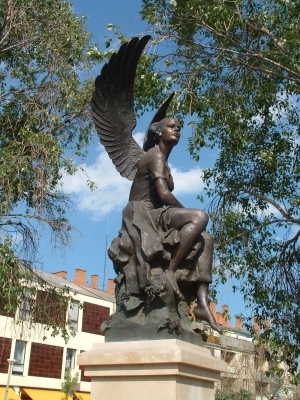 Public areas and edifices of the capital of Great Cumania, primarily in the town centre, are decorated with lots of statues. Beyond these statues there are ornamental wells, small wells for splashing springs as well as ornamental gates made of wood and wrought-iron making the streets and alley-ways of the town more evocative. Karcag is the town of music and folk songs. Concerts of great local orchestras and choirs are organized in the town, street music performances are also held by them in summer. Karcag is a tasteful town. The cooks cooking the best mutton stewed with paprika live in the town; shepherds' dishes of the town (e.g. old-style "lebbencs" soup) are also famous, the dish for the initiation of shepherd boys' is a real delicacy in restaurants and there are women living in Karcag who can still bake twenty kinds of milk-loaves. Come and taste the specialities of Karcag.